We spent a fair amount of time building this handy dandy basement. It's somewhat tricky getting the city to approve a basement but it's a huge plus in my book because everyone can always use extra storage space. Luckily James Witt is a master at getting basements (which don't count towards your maximum allowable square footage) approved by the city. Because of the complexity and extra cost, we didn't put a basement in our own house and I'm always kicking myself now that I've learned how much stuff one accumulates when you have a kid. Basements are also perfect for storing wine, (which is also nice to accumulate and guzzle when you have a kid). Daniel putting the finishing touches on the rat slab. 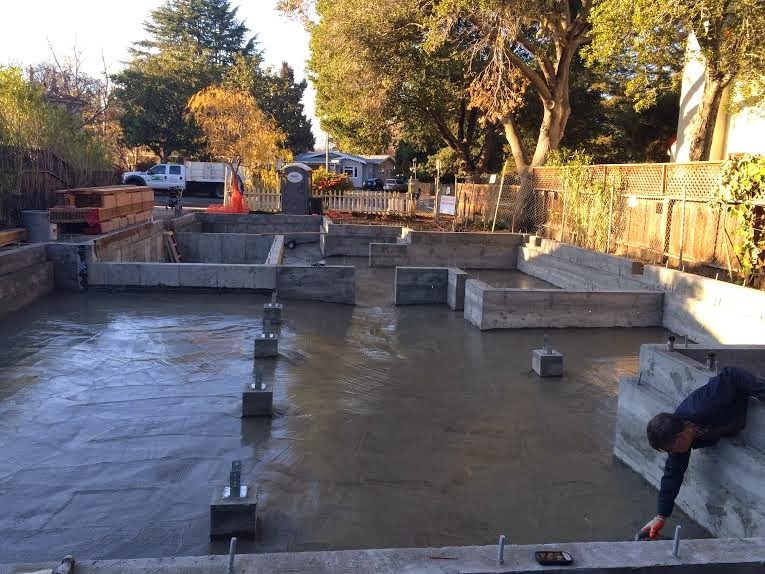 Like all his homes, James doled out to put in a rat slab. It's one of those nice but invisible upgrades. Check out this post if you don't know what a rat slab is and why it's such a nice feature. Just for kicks, next time you're at an open house, ask them if the house has a rat slab. We're currently in the framing stage. This is when the house really starts to come to life. James never sells his houses before the framing is finished because you can only tell so much from floor plans. Once the framing is done you can get a feel for the flow of the space, the size of the rooms and the views from the windows. 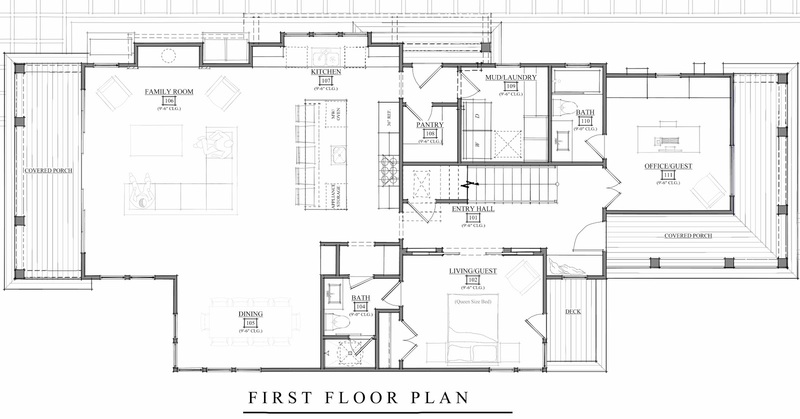 Above is the floor plan for the first floor and below is the framed out family/dining/kitchen aka the great room. Ah, the great room. This is my favorite room in the house. We spend the majority of our waking hours in ours. For a peaceful environment, it's important to have lots of natural light, big windows/doors and nice greenery to look out on. A backyard with mature trees and privacy is one of the most important attributes I look for when evaluating a property to build on. 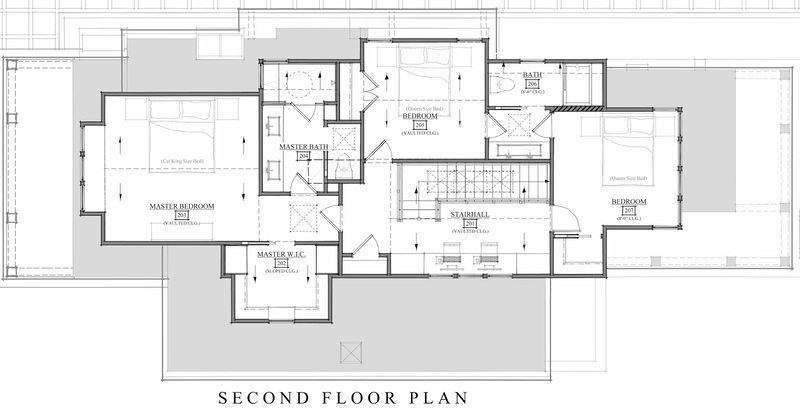 Above is the floor plan for the second floor. Until the framing went up, I didn't realize how cool the various vaulted ceilings are going to be. Also, the view of the redwood tree from the master bedroom is sublime. The street view of the house..